Welcome back to Anna’s World! Today I have Barb Han with me. I’ve asked her a lot of questions and she’s been gracious enough to answer them. Let’s see what she has to say! First, I’d like to thank you for hosting me on your blog today, Anna. Oh, you’re so welcome, Barb. I’m glad to have you here. Let’s get started. 1. What inspired you to choose your genre (genres)? I loved romance but didn’t know if I could write one, so I literally lurked in the back of a local romance conference. I was too scared to talk to anyone. Eventually, I plucked up the courage to join my local chapter’s loop and romance ideas started coming to me. We all have issues with balancing our time between writing, editing, promoting, along with other obligations and personal time. What works best for you? Seeing the word balance does make me chuckle. As a working writer with three kids, I keep thinking I need to get some of that balance. I do try to keep life as simple as possible. The two most important things to me are my family and my work, so that’s what I spend 95% of my day on. Everything else has to wait for a turn. Also, sadly, I gave up TV a few years ago. I miss it. Tell us about your characters. What type of hero do you normally choose? What type of heroine? This is a great question. Most of the time one or the other just shows up and starts telling me their problem. Once I get enough details about them and/or the story (via loose plotting), I start writing. My heroines are a match for the strong heroes in my stories and they take me on the journey along with them. Who are some of your favorite authors? Did they inspire you to write? I felt inspired to write from a really young age. When I was little, I read every Nancy Drew and Hardy Boys book I could get my hands on. I still love a good murder mystery or suspense read. Most people will recognize these names: Stephen J. Cannell, Sandra Brown, Linda Castillo, Cindy Gerard, and Harlen Coben. I also read these up and coming authors: Jerrie Alexander and Diana Layne. What has been the most difficult aspect of your writing career? Having my first two releases come out within days of each other was an interesting problem. Soon after, I signed with Harlequin to write for Intrigue (squeee!). Trying to balance writing with promoting on top of a super busy schedule for my kids has been interesting to say the least. I barely skidded into summer this year grateful for the calmer pace. And yet, I wouldn’t change that ride for the world! Give us a little dirt about yourself. What’s your favorite guilty indulgence? Since I do a lot of research on weapons, the military, the FBI, etc, I’m pretty sure I’m on a couple of Watch lists. I would feel sorry for anyone who actually had to listen to my calls or shadow me for a day. They might actually succumb to boredom. Carpool? Again? Since I consider chocolate a necessary food group, I’d have to say my guilty indulgence is e! News. Don’t judge. Tell us about your newest book. Thank you so much for asking. 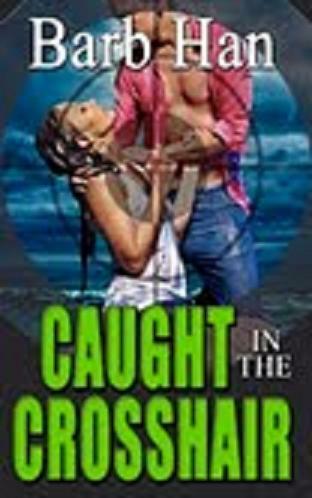 Caught In The Crosshair is about a sister who is determined to help her brother no matter what it ultimately costs her. She teams up with an ex-special forces sniper and the race to save her brother (and themselves) begins. Lauren James had learned the hard way that sometimes the best childhood was a brief one, that there was a direct link between determination and success, and it only took one phone call to unleash hurt and memories she’d spent the past decade trying to suppress. “H-h-elp me,” a man’s voice choked out. It was strained and cracked, and he gasped for air when he spoke. Even so, his identity was unmistakable. She drew a breath, forcing air into her lungs. “L-l-isten.” He made a strangled noise before his mouth must’ve moved away from the receiver. She heard a train and more voices. One…two…three…she counted, identifying at least three men with terse South American accents. A crack followed by a pained grunt dropped her stomach to the floor, scrambling her nerves. “Max. Max? Are you there? Are you hurt? Who’s doing this to you?” The words fired off like buckshot. More muffled noises, and then a tortured scream seared her eardrums. “Pay? Pay what? Pay whom?” Should she call the police? Maybe she could reach her cell phone and dial 911 now while she still had them on the line? Icy regret stabbed her chest. Why hadn’t she taken any of his calls in the past six months? Because the last time he called four years ago, he wanted to use her for money. “No. Don’t hurt him. Tell me what to do,” she said, trying to keep panic out of her voice. Think. Think. Her cell was in her purse in the kitchen. Could she get to it? No police. Of course they would have anticipated that. She’d have to go alone. Alone. Panic brought bile to the back of Lauren’s throat. It burned. Scuffling noises came through the line before another loud crack sounded. On a tropical island with a hurricane brewing and dangerous men closing in, Lauren and Jaden will need to work together to survive and find her brother. The cartel seems to be one step ahead and Jaden’s operatives are being killed one-by-one. He will have to use all his specialized training and risk everything, including his heart, to outwit the deadly group and keep Lauren safe. Their magnetic attraction isn’t helping matters…because even a slight distraction might just get them both killed. Thank you so much for joining us today, Barb, and best of luck to you! Until next time, have a great week!! !